An analysis of data from around 14,000 people finds that those carrying a variant of a gene called APLP2, were five times more likely to have myopia (nearsightedness) if they had spent an hour or more reading each day when they were children.Myopia is an eye condition where people can only see sharp images when they look at near objects, with objects in the far distance appearing blurred. This is usually caused by the eye being elongated, so that when looking at distant objects, the focal point of the projected image inside the eye is in front of the retina and not on it.The researchers note that myopia is the most common vision disorder worldwide and is reaching epidemic proportions in some regions. 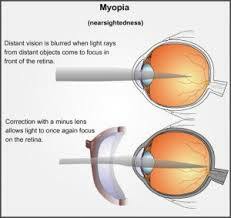 For instance, in the US, prevalence of myopia has climbed from 25% to 44% of the adult population in the last 30 years. In some parts of Asia, as many as 80% of young adults are affected.Research shows myopia is a major risk factor for potentially blinding eye disorders such as cataracts, glaucoma andretinal detachment. The risk of developing these disorders is comparable to that of high blood pressure for strokeand heart attack, the authors note.